Researchers believe that these next-generation materials could lay the groundwork for developing efficient and cheaper optoelectronic technologies that have the potential to convert electricity into light or vice versa. The results of the study have been published in Nature Communications. This particular work is solving a critical problem that has inhibited the development of viable applications based on these materials. Along with physics doctoral student Xi Wang, Gao was working with a group of materials known as halide perovskites. According to researchers, these types of materials offer excellent potential for optoelectronic technologies because they are not only highly efficient but can also be obtained in a more cost-effective way. Conversely, in these optoelectronic technologies, researchers have to adjust the color or the bandgap of the light emission. This has been slightly difficult in halide perovskites. Halide perovskites have always made it to possible to adjust colors; however, such color tunability has not been stable. For instance, a device made with this material may shine a single color, for example, yellow, but when it is continuously illuminated by UV light, it changes to red rapidly. “When you design it, you want it to turn out how you expect,” stated Wang. “If you buy a yellow light bulb, you're not going to be happy if it is shining red after a few uses,” added Gao. The duo, along with their collaborators—Professor Shangchao Lin of Shanghai Jiao Tong University in China, and Yan Xin, a researcher at the National High Magnetic Field Laboratory—discovered a new method on how to stabilize it. However, according to Gao and Wang, the discovery was nearly an accident. 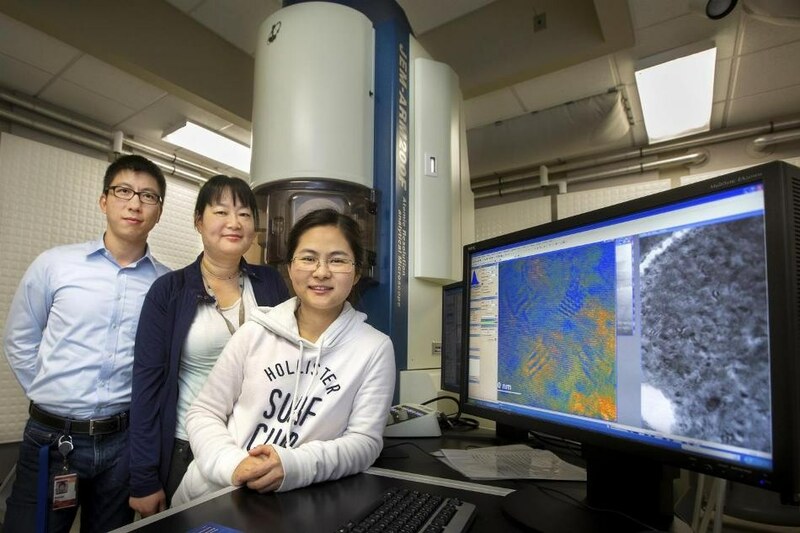 Initially, they set out to develop a better-quality halide perovskite film that was more uniform and smoother when compared to current samples. Within their sample, they subsequently integrated nanocrystals in a unique matrix. However, Gao and Wang were not prepared for this to impact the bandgap, or the physical characteristic that establishes the color of light being absorbed or emitted by the material. This special nanostructure was able to convert the earlier unstable materials into highly stable counterparts even when they are activated by concentrated UV light that is 4,000 times more powerful in comparison with the solar radiation. According to Wang and Gao, other investigators in the field will hopefully follow up on their work by analyzing additional electrical behaviors using this composite structure. The Office of Naval Research Young Investigators Program and the Energy & Materials Initiative at FSU funded the study.